My company requires a legal splash screen (big brother is watching you) for any software tools that requires an account and a login. Is there a feature for the WQS Admin to create a custom screen that comes up before login, during login, or just after login? I'm not too familiar with WQS, but I assume it uses the same default splash screen as other Windchill modules, which is just the index.html file in <Windchill>/codebase. You could customize that index.html file to fit your needs, or have it redirect to a separate splash screen after login. Hi Gerry, I'm not aware of anyway to do this other than to customise the Start Page and apply that to all groups/users. We have a similar requirement. This should be a product idea - WQS pop-up screen capability off the Start page. 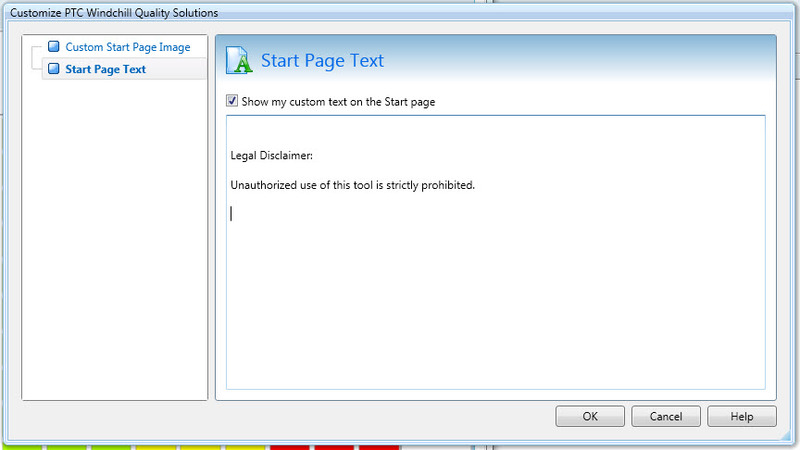 In the Enterprise edition It is possible for System Administrators to add text and images to ALL start pages for all users. The System Administrator will be able to add a custom start page image and start page text that may help to fulfill your requirement for legal disclaimers. Only System Administrators are permitted the ability to add the images and text. For more information search for "Customize Start Page" in the Windchill Quality Solutions Help.